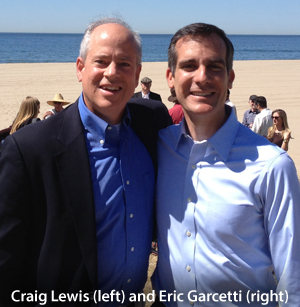 Craig Lewis recently spoke with Mr. Garcetti about making Los Angeles a national leader in the new energy economy. Eric Garcetti currently serves as a Los Angeles City Councilmember, representing the 13th District. Mr. Garcetti was elected by his peers four times to serve as President of the Los Angeles City Council from 2006 to 2012. Now, Mr. Garcetti is running for Mayor of Los Angeles – in a race that will be decided on May 21st. The Clean Coalition knows Mr. Garcetti to be a stalwart champion of clean local energy. Recently, he authored legislation to establish the 100 megawatt (MW) CLEAN LA Solar Program. According to the Los Angeles Business Council, this 100 MW of local solar will create up to 4,500 jobs, generate $500 million in economic activity and offset 2.25 million tons of carbon dioxide emissions by 2020. Additionally, the Sierra Club officially endorsed Eric Garcetti as their candidate for Mayor due to his outstanding environmental record. As Mayor, Mr. Garcetti is committed to significantly expanding the production of local solar power in Los Angeles – specifically setting a level of 1,200 MW by 2016. Craig Lewis, Founder and Executive Director of the Clean Coalition, recently had the chance to talk with Mr. Garcetti about making Los Angeles a national leader in the new energy economy, as captured in the relevant dialog below. Craig Lewis (CL): Mr. Garcetti, you are committed to deploying 1,200 MW of solar energy within the City of Los Angeles by 2016. Why are you so dedicated to this objective? Eric Garcetti (EG): Making Los Angeles a solar energy leader will make our city healthier and more prosperous, and will help achieve my goal of a coal and nuclear-free DWP. I am 100 percent dedicated to a 1,200 MW solar goal, which would keep harmful pollution out of our atmosphere and lungs, and would inject more than $2 billion into our local economy. An aggressive commitment to solar will kick-start a new energy economy in Los Angeles, moving us away from a status quo that sees us cede leadership and spend money buying energy outside of Los Angeles. At a 1,200 MW scale, Los Angeles will approach the economies of scale enjoyed in Germany, which is currently deploying rooftop solar at an extremely competitive 7 cents per KWH — a level cheaper than any source of energy available to Angelenos today. CL: Why have you specifically committed that at least half of the 1,200 MW of local solar come from an expansion to the CLEAN LA Solar Program? EG: I am proud to have spearheaded the creation of Los Angeles’ feed-in-tariff program, and its initial stage has delivered data and feedback from customers and solar businesses that makes for a successful model that can and should be expanded. Feed-in-tariff programs accelerate solar deployment by allowing for the utilization of a rooftop’s full solar potential, even if the site itself has only a small power demand. Until L.A.’s FiT was launched, 75 percent of our city’s rooftop market was ineligible for solar because of insufficient load or because so many buildings are non-owner occupied or multi-tenant. CL: How can the Clean Coalition help you make the 1,200 MW of local solar a reality in Los Angeles in the most timely fashion possible? EG: I would encourage information sharing so L.A. can get ahead of the curve by taking advantage of the lessons learned by the Clean Coalition in designing and implementing CLEAN Programs across the country, like in Long Island, Fort Collins and Palo Alto. I would also encourage the Clean Coalition to continue communicating its robust analyses on the economic benefits of solar to build greater public support. I believe the Clean Coalition’s Distributed Generation + Intelligent Grid Initiative could be leveraged here in L.A. to prove that renewables can be used to provide a significant percentage of energy requirements, while at the same time, improving grid reliability with intelligent grid solutions like demand response, electric vehicles, and energy storage. CL: If elected the next Mayor of Los Angeles, which we will know on May 21st, how fast can you move on the 1,200 MW solar goal? EG: I would move forward immediately. I have already laid the groundwork through my policy work on the council, and as a candidate, I have been meeting with solar stakeholders not just to earn their support for my campaign, but to exchange ideas so I can hit the ground running. CL: How can other parties help you achieve 1,200 MW of local solar for Los Angeles? EG: Tell your friends, family, co-workers to vote! And make sure they vote for Eric Garcetti!